The area of study is located at Wadi El-Nakheil to the west of Quseir district along the Egyptian Red Sea Coast. The present work is a case study of applying the 2D homogeneous function method. This function automatically inverts the first arrival refractions to derive a 2D velocity distribution involving the seismic boundaries. The present study aims at investigating the near-surface geological conditions of Wadi El-Nakheil. These conditions include the following: the different stratigraphic units, structural configuration, and the groundwater occurrence. Authors achieved this aim by carrying out shallow seismic refraction measurements along three profiles using direct and reverse shooting. A newly developed field methodology is used in the data acquisition. The interpretation of the seismic data is performed using GODOGRAF software which represents a 2D refraction tomographic inversion algorithm. 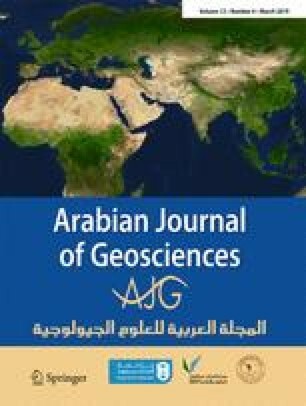 The interpretation revealed the presence of seven geo-seismic zones, overlain by low-velocity surface layer, with a velocity range of less than 800 to 6800 m/s. The detected zones are dissected by several normal faults with NE and SW dipping directions and maximum throw of about 20 m. An angular unconformity is noticed between the overlying horizontal layers and the dipping (towards SW) underlying layers. One of the interpreted zones is identified as the water-bearing zone where the velocity is between 2200–2400 and 2600 m/s. This was emphasized by the correlation with the nearest borehole in the area. The water-bearing zone is interpreted as the Nakheil Formation. The thickness of the water-bearing zone ranges from 20 to 55 m, while its depth ranges from 35 to 65 m.